After seven-plus seasons calling Petco Park home, Will Venable entered the visiting clubhouse at the San Diego Padres’ stadium on Monday. "I’d never seen it before," said Venable, who was traded to the Texas Rangers two weeks ago. "It’s a little weird, but otherwise it’s great to be back in San Diego." Prior to being dealt to the Lone Star State, Venable had called San Diego home for the entirety of his major-league career. Venable admitted that it was difficult for him to depart the team after developing relationships with his Padres teammates and coaches since 2008. "It was an interesting experience," Venable said. ‘It’s tough to say goodbye. Saying goodbye to people you love and a place you love is difficult to do. At the same time, I was super excited for a new opportunity." The feeling was mutual from his teammates. "It was tough to see him go," infielder Jedd Gyorko said. "We got really close. We spent a lot of time together over the last couple years. Any time that happens, you all understand the business aspect of it, but it’s still tough to see a friend and a mentor go off to somewhere else." 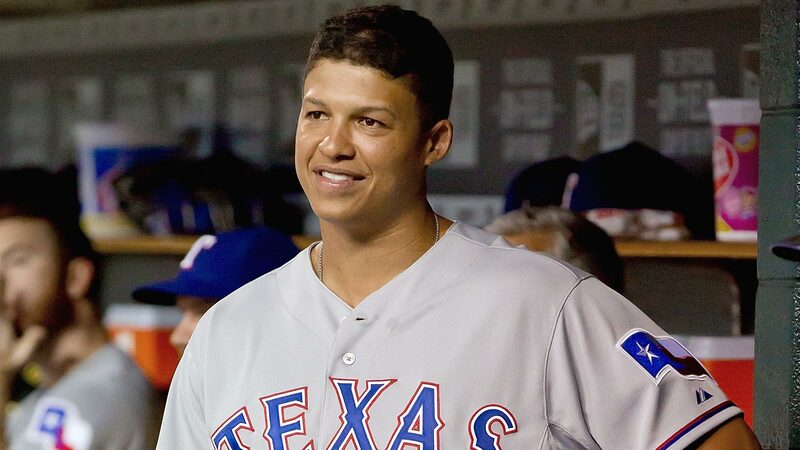 Venable was 0 for 2 with two walks in his first game against his former team, but has had a positive impact on the Rangers in the brief time he’s been with the club, hitting .273/.429/.318 with an RBI and a stolen base in nine games, and making solid defensive plays as he frequently did while a member of the Padres. "It was a little nerve-wracking at first," Venable said of making the transition to a new team. "The best way to fit in is to help the team win. It doesn’t have to be with a big hit or a big play – just going out there and putting forth the effort that’s asked of you."